The love affair between Aprilia and V4 motors is no secret. As fearsome as the bikes are, Aprilia’s Tuono and RSV4 are motorcycles that speak directly to your soul. However, the Noale-based bikemaker has had to pay heed to another fellow Italian manufacturer, who hails from Bologna. Ducati’s Panigale V4 has created waves in the superbike world, going on to win six out of six races in the 2019 World Superbike Championship. Aprilia had to retaliate. Their reply comes in the form of the RSV4 1100 Factory, a motorcycle solely designed to put the Panigale back in its place. Does it? We were lucky to have a small spin on it -- at Mugello of all places. Sadly, we are still awaiting the images from the event. It is noteworthy that in recent times Aprilia has played it a bit subdued with the RSV4. Far from being ostentatious, it has barely got any flashy colours. But it at least got the Italian tricolore sprawled across the fairing. However, for 2019 has Aprilia has gone one step further to make it look even more subtle. No need to be disheartened. Draped in a special matte black colour, the 1100 Factory looks set for a stealth attack. Then it gets the new ‘Atomico 6’ livery. To those who know their periodic table (yes, high school chemistry for the win), carbon is the sixth element. So the front mudguard, underseat side panels, heel plates, exhaust terminal guard and side winglets are made from carbon fibre. The rest of the elements, such as the pressed aluminium frame and the double-braced aluminium swingarm, get a contrasting metallic finish and they play rather well with the dark theme that Aprilia is going for. Couple that with the gold Ohlins NIX forks, the titanium finish on the aluminium forged wheels and street-legal Akrapovic exhaust, the RSV4 1100 Factory looks like a motorcycle fit for Batman. Aprilia takes immense pride in claiming that their 1100 Factory is the first motorcycle in the world to offer winglets as standard. What they mean by that is that it is the first non-homologation special motorcycle that gets the aero wizardry. At first glance, it does look like something unnecessary jutting out from the sides, like Dumbo’s ears. But it serves a greater purpose than aesthetic pleasure. Taken off its MotoGP cousin, the RS-GP, the winglets are tested inside a wind tunnel. The design maximises front-end downforce, which aids in high-speed straight-line stability and limiting wheelies out of corners. Ducati made a big impact with the Panigale V4, which charges forwards thanks to 214 Italian thoroughbred stallions from its 1103cc motor. Aprilia did not want to sit back and watch and they too increased the cubic capacity of the RSV4 from 999.6cc to 1078cc (bigger 81mm bore, 3mm larger). This helps the RSV4 1100 Factory push out 217PS. Noale once again gets the upper hand. Bologna still talks the torque as it doles out 124Nm, 2Nm more than the new RSV4. It is the manner in which the torque is delivered which makes the two Italians so vividly different, though. The 90-degree V4 and counter-rotating crankshaft make the Panigale a visceral beast. The electronics curb its attacking instincts by a big margin. That is not the case with the RSV4. Thanks to a 65-degree V4, Aprilia has managed to keep the 1100 a bit tamer. The electronics do a fantastic job of reining in the power, making it an enjoyable affair every time you open the taps. Do not get me wrong -- in the wrong hands, it too can be lethal. So while you don’t have to be Andrea Iannone to enjoy the RSV4, you do need to be as skilled as Andrea Dovizioso to truly be sensational on the Panigale V4. Aprilia has been one of the leaders of the electronics game. Right from the start, the electronic suite on the RSV4 has been super impressive. Eight-stage traction control, three levels of wheelie control, three levels of launch control, three levels of ABS intervention, cruise control and an adjustable pit limiter are not new to the APRC (Aprilia Performance Ride Control) electronics package. Even the three riding modes - Track, Sport and Race - were found on the old RSV4’s. What is different is that they have been retuned to suit the bored-out motor. Plus, you can adjust traction control and wheelie control on the fly without shutting the taps, and that’s the tech debuting on the 1100 Factory. Mugello is one of the circuits that I have always dreamed of visiting, and riding even a single lap on it was a bucket list moment. To be let loose for 15 minutes on a track weapon such as the RSV4 1100 was just the icing on the cake. However, once I climbed aboard the bike, it did not feel too intimidating. The riding position is aggressive, but not as much as the Panigale. This is thanks to the revision on the front end of the frame which has brought the rider closer to the bars with an overall reduction in wheelbase by 4mm from the old RSV4. You do end up loading the front end a bit more, but even after the short session, my wrists were hardly complaining. But that was on the track. 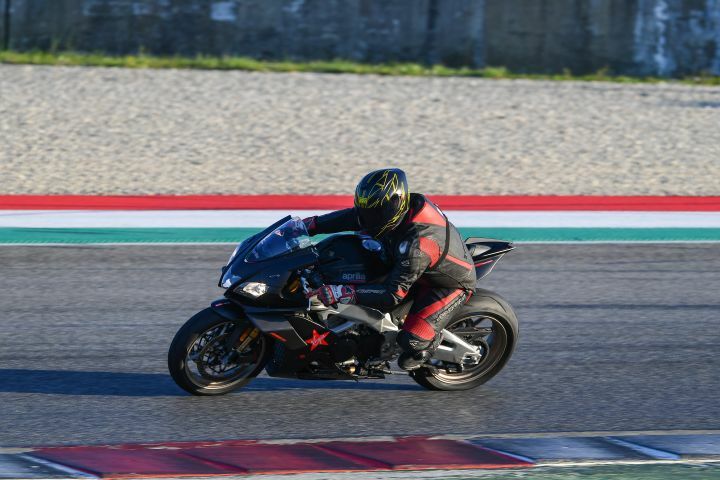 The fast and flowing layout of Mugello allowed even someone like me, who has limited knowledge of both the track and riding a litre-class supersport, to keep the RSV4 1100 Factory right side up. I did start off with TC at a high 6 but as I was getting confident, it came down to a 3. Even then, there was little rear wheel sliding action. Credit has to be given to the super sticky Pirelli Supercorsa rubber. What made the experience all the more enjoyable is just how easy it was to flick the RSV4 from corner to corner. Going from the right-hander Casanova to left-hander Savelli and into the double-right uphill Arrabiata corners, the second one of which is a blind exit, there was little movement from either end of the motorcycle. You can really wring open the throttle and the electronics will never overpower your senses. And to top things off, the slick bi-directional quickshifter is one of the best I have experienced on a motorcycle till date. Had I been given the opportunity, I would have cranked up the preload by just a notch or two. The stock setting on the Ohlins NIX USD was a bit soft for my weight and there was a bit of front dive while hard braking. But braking stability is beyond imaginable. State-of-the-art Brembo Stylema calipers deserve all the plaudits. And thanks to Bosch Cornering ABS system, trail braking is not a scary affair either. I would have loved to delve further into several modes and tried limiting the electronic intervention but fifteen minutes was all I got. And ironically, that is the same amount of time I have spent on the Panigale V4. So, to make a well informed decision as to which would be the one to put your hard-earned money on, we would be doing a disservice. However, with just this limited experience, I think my money (if I ever have that much moolah, that is) would be on the RSV4 1100 Factory. It is a safer bet and as far as I am concerned, with such power it is better to be cautious than sorry. As far as pricing goes, we reckon that the Aprilia RSV4 1100 Factory would arrive with a price tag in the region of Rs 25 lakh, ex-showroom obviously.